Almost any disease will spend some time in your body before making you ill, summoning its forces or just lying in wait. But some maladies are even more patient than that. Some ailments can spend decades lurking in your body, dormant and unknown, until they suddenly spring to life. Let's take a look at some of the most patient diseases that you could already have, without knowing. 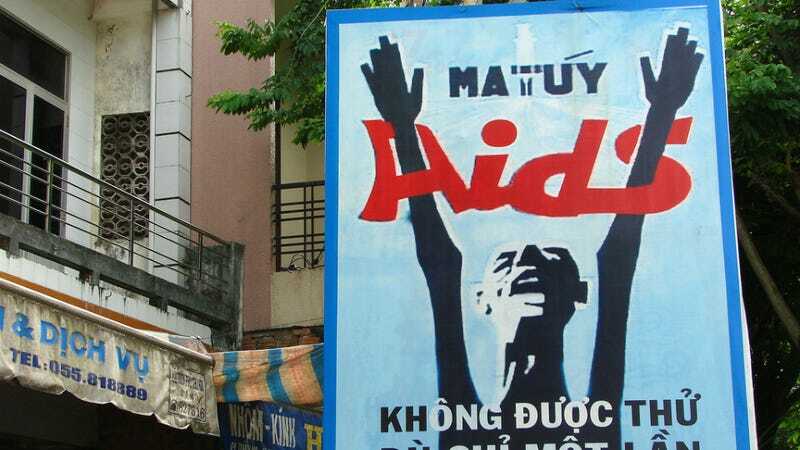 Top image: AIDS education poster in Vietnam, photo by Dr. Adam Jones/Flickr. The most famous, and the most dreaded, virus that stays dormant in the body for years is HIV — which introduced many people for the first time to the notion that you could look perfectly healthy but still have a communicable virus. But there have always been illnesses that had incubation periods of anywhere from years to decades. And these diseases have spurred many legends about how they were spread, and why they stayed hidden — but today we'll look at the facts. Leprosy was one of the most feared diseases in the world. People who had it were sequestered from the rest of society in leper colonies. The disease was so common and the colonies so populous that colonies had their own crafts, and even their own internal currency. Which didn't mean anyone wanted to live there. The tenants of leper colonies were shunned, and people would take mercury in an attempt to drive the disease out of their bodies. This didn't work — and to a certain extent, shunning didn't work, since leprosy can reside in a body for anywhere from a few weeks to twenty years before any symptoms show up. This is because, relatively speaking, leprosy was and is a weak disease. It's caused by a bacterium that, in the case of many people, can be fought off by a healthy immune system. Even when you can't fight it off, the bacterium is killed off by overly high temperatures. This is why leprosy is common in armadillos, which have a low body temperature — and why it first appears on the extremities and the nose in humans. As the bacteria spreads and compromises your circulation, it slowly works its way inwards. Essentially, leprosy allows people to have a long, symptom-free existence, because it needs an opportunity to work. Today, a combination of drugs can cure it quickly and easily. Although great strides have been made towards ending leprosy, there are still colonies in many countries. Diseases caused by prions, known as a group as transmissible spongiform encephalopathies or TSEs, are another set of diseases that can lie dormant for decades before striking. There are examples of this all over the world, in all different species, from sheep and cows, to humans. Prion diseases were first observed in humans in the form of kuru, a degenerative disease found among people in Papua New Guinea. It's possible that the disease started as a heritable genetic trait, but for the most part it was spread through cannibalism. Later, Creutzfeldt-Jakob disease, a similar neurological disorder, was found all over the world. It seemed to run in families, but could also spring up seemingly out of nowhere. When "mad cow disease" made headlines, we saw the same symptoms all over again. And, because diseases of this kind can lurk undetected in a body for decades, we will probably keep seeing it. Prions are tiny forms of protein that lack nucleic acid. This makes them largely immune to radiation and high temperatures — two ways that we render food safe. They eat away at the brain and the nerves, slowly taking away muscle control and lucidity as the disease progresses towards death. Prions work by converting certain proteins in the body into more prions. The balance of the two, the access of the prions to those proteins, and the ability of the body to resist, make for incubation periods of up to thirty years. There's still no known cure for any of these diseases. This was a terror of the early tropical explorers. It was said that Charles Darwin contracted it during his scientific expeditions, as did many unlucky roving Victorians. The disease was transmitted by so-called "kissing bugs." These bugs would settle on a person as they slept and bite their lips. The bugs transmitted the parasite Trypanosoma cruzi. At first, the parasite would cause chills, fever, and acute pain as it multiplied in the body. After a time, most healthy people would recover and return home. But the parasite hadn't gone away. Instead, it infected the person's body, putting strain on both the heart and the intestines. At first the victim wouldn't notice — but after a decade or so, the strain got to be too much. Most infected people would experience chronic digestive disorders. Both heart and intestines would enlarge until they were taxed to the limit — and eventually they would burst or tear apart, killing the infected person. The incubation period depends almost entirely on the health of the person and the aggressiveness of the parasites. Chagas is still around today, and about nine million people are infected. The drugs for it are in short supply, and it has to be treated early, to be effectively treated at all. This is one of the diseases that most health officials think will be a problem in decades to come. Via The Lancet, NY Times, WHO, and Utah.edu.